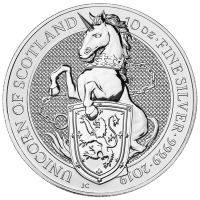 Reverso Imagen estilizada de un Unicornio sosteniendo un escudo con el escudo de armas de Escocia y las palabras "Unicornio de Escocia 10 oz plata fina 9999 2019"
Imagen estilizada de un Unicornio sosteniendo un escudo con el escudo de armas de Escocia y las palabras "Unicornio de Escocia 10 oz plata fina 9999 2019"
Serie Bestias de la Reina de la Casa de la Moneda Real | Moneda de plata Unicornio de Escocia 2019 de 10 onzas Purchase your 10 oz 2019 Royal Mint Queen’s Beasts Unicorn of Scotland silver coin from our online store today to enjoy the best price on the web. This show stopping addition to the widely acclaimed Queen’s Beasts series brings into dazzling relief the majesty of Scotland’s (mythical) national animal. The reverse feature is a stately depiction of the unicorn of Scotland rearing over a shield bearing the British coat of arms, complete with a meticulously detailed rendering of the lion of England on its face. Also on the reverse, the coin’s title; details of weight; purity and metal content; as well as the coin’s year of issue. The coin’s obverse is home to Jody Clark’s immaculate rendering of Elizabeth II in her Diamond Diadem, Brough to life against a field of the finest micro-engraved texturing. Also on the obverse, Elizabeth II’’s full, regal title, along with the coin’s unique denominational value. The Queen’s beasts series features artist, Jody Clark’s breathtaking renditions of the ten heraldic beasts which stood watch over Elizabeth II’s 1953 inauguration, as sculptures by renowned artist James Woodford. Celebrate British royal heritage and fortify your holdings with a 10 oz 2019 Royal Mint Queen’s beasts Unicorn of Scotland silver coin today.